Carlos Checa did the double at today’s round of World Superbike action from Silverstone. 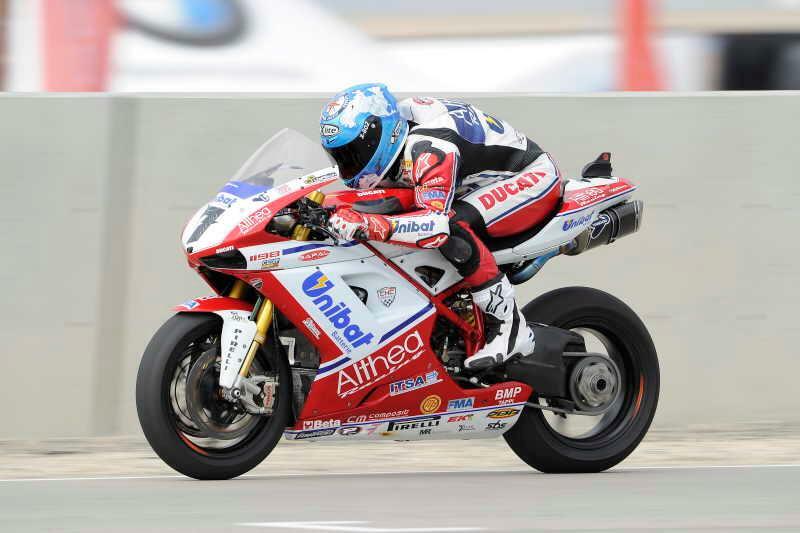 The Althea Ducati rider moved past Yamaha’s Eugene Laverty early in the race and was able to slowly eek out a two-second gap over the Yamaha man. Checa was delighted to take maximum points at a circuit he prepared to struggle at before the World Superbike summer break. And in addition to winning Ducati’s 300th and 301st World Superbike races, today’s second race was Checa’s 100th in the class. Checa said: “It’s a perfect weekend for me. For us, honestly, we didn’t expect to win here because we struggled last year. But it didn’t come for free, we worked hard from the beginning. Laverty ended up second after slowly being left by Checa, but managed a two-second gap of his own ahead of the chasing pack of teammate Marco Melandri and Alitalia Aprilia’s Max Biaggi and Leon Camier. Laverty said: “We were a lot closer in the second one. I was able to stay with Carlos for a few laps but I really used the tyres to try to stay with him. Melandri won the fight for the final podium position, making it an identical podium to race one. Despite the cooler conditions in the afternoon that resulted in the race’s fastest lap being a second quicker, Melandri opted for a harder rear tyre than in the first race. But the Italian is looking for race wins, and said that he’s conceded the title to Checa and has his sights set on an assault next season. Polesitter John Hopkins faded to seventh after encountering tyre difficulties in the dying laps of the race after fighting desperately to hold onto the leading group. Fellow wildcard rider Alex Lowes retired from the race.